The National Association of Wabash Men believe a national day of service fits right into Wabash’s core values and the gentleman’s rule. The inaugural Wabash Day, Oct. 29-30, will give Wabash alumni and students an opportunity to serve their community. "Our core values come from two principle sources," Wabash Day chairman Jon Pactor ’71 said. "The Gentleman’s Rule requires us to be gentlemen and responsible citizens on and off the campus. Most of the time it’s the gentleman part of the rule that is emphasized, but here we’re talking about the responsible citizen part of the rule. "The second source of the core values comes from the mission statement: to think critically, act responsibly, lead effective, and live humanely. If we think critically, act responsibly, lead effectively, we will make our communities live more humanely." As many as 20 of the national associations have indicated they will participate in the community service project. But an added benefit thus far has been another way of bringing Wabash men together. "I was enlisted out of necessity," Dustin DeNeal ‘04 said. "Bloomington has a large alumni base, and no alumni association. Because of this, Jon Pactor enlisted Pat East ’00 and myself to organize the Wabash Day activities here. 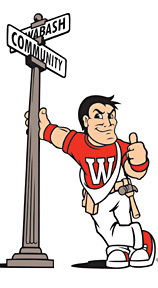 "Wabash Day is a great chance for people to see the difference that Wabash men make in their communities. It's a relatively simple but influential opportunity. We hope to make a significant contribution to the community while at the same time demonstrating the impact that Wabash has on the world." Pactor said DeNeal’s attitude has been an added benefit to the NAWM’s idea. "We’ve already gotten success having alumni who haven’t participated in much are now participating," the Indianapolis attorney said. "We have already succeeded in that associations have undertaken projects where they haven’t been doing anything. And of course, whatever good we can do in our community will make Wabash Day a big success." "It’s a big deal to get a large number of people to volunteer to do something for someone else," DeNeal said. DeNeal and East will lead a group doing landscaping and sprucing up around a community youth center. "If nothing else, we're hoping it will be a great chance for Wabash men to reconnect and spend a day working together." As many as 100 Wabash alumni may be tackling projects in Marion County and more across the country. "We have about 30 associations that have indicated they will participate," Pactor said. "But we don’t know how many volunteers any of those groups have yet." "We’re looking in Marion County to have maybe 50-100 or more volunteers. Montgomery County could also have a large turnout as well." A full list of project leaders, and Pactor’s contact information, is available on the Wabash website. Brownsburg: The alumni of Brownsburg will be conducting a "Clothing Drive" with the Sheltering Wings. Sheltering Wings provides a safe have with 24-hour admittance for women and their dependent children suffering from domestic violence and works to reduce domestic violence. Wabash alums and their families will be coordinating pick-ups for clothing donations within their specific neighborhoods. Drop offs will be made on Saturday and Sunday, October 29 and 30. The alumni will be addressing some specific "need" items for the Shelter. To volunteer or get further details, contact Kelley House '90 at Kelley.House@twtelecom.com or at 317-508-7817 (cell). Mark Dewart '74 at mark.dewart@abbott.com, 847-937-3178 (work) or 847-209-3239 (cell). Evansville: Evansville alumni will purchase and install a playset at a local homeless shelter for women and children. The alumni are raising funds for the project. To volunteer, contact Thom Leffick at LIFFICKT@southwestern.org. will help with the ongoing beautification around the grounds of its main office in Jeffersonville. Thanks to John Grannan '97 at johngrannan@hotmail.com. Indianapolis: Partners In Housing Development Corp. is a non-profit organization that owns and manages facilities to house the homeless and people with special needs. It provides social services with the goal of making the residents self-sufficient. We will be doing a lot planting on the landscape at its eastside location. 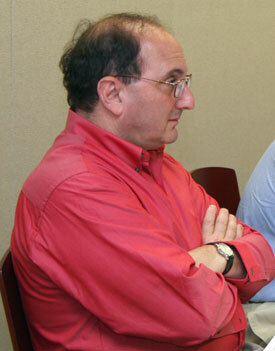 Frank Hagaman ‘72 is the president of PIH. March of Dimes. We will be helping the March of Dimes place ribbons on 100-200 trees in three parks in downtown Indianapolis. Greg Mead ’91 is assistant director of development with the MOD, and Dan Witte ’92 is on its board. The Villages. We will be helping the Villages with fix-ups at their center. The Villages is an incredible agency that assists abused children. Linda Adams, wife of Skip Adams ’71, is its director of development. Minneapolis-St. Paul: The Minneapolis Area Wabash Alumni will be providing services to People Serving People, Inc. (PSP), a homeless shelter and service center, on October 29. PSP provides temporary emergency shelter, full meal service, transitional housing, education and activities programming, and it works with more than 30 collaborative agencies to provide support for homeless families in the area. PSP can house up to 396 persons in its shelter and can house up to 44 persons (10 families) in its ten 2-bedroom transitional housing apartments. The alumni will work with the PSP by serving the early meal to the PSP residents and then providing transitional assistance to ready the food service for the next meal. To volunteer, contact Charlie Crowley '70 at ucam@qwest.net or mplscrowley@hotmail.com. South Bend and St. Joseph County: The alumni of South Bend and St. Joseph County will have a full-day of service at the YWCA beginning at 9 a.m., October 29. Each volunteer does not have to commit to a full day. The alumni will be working in the basement storage area, including building shelves, putting a sealant on the floor, and moving various materials. There may be some yard/maintenance work. Spouses and children are welcome, too. To volunteer, contact Peter Horvath '92 at Peter.F.Horvath.50@nd.edu. Jon Pactor '71 at recent NAWM board meeting.